When the mercury drops during winter, one ought to take the necessary steps in order to make sure that one remains nice and warm, especially with your fingers since we all more or less use smartphones these days, and not everyone has a pair of gloves that will be able to work with touchscreen displays seamlessly. Having said that, others prefer to rely on the old standby, which is to have a swig of alcohol from time to time in order to keep oneself warm from within. 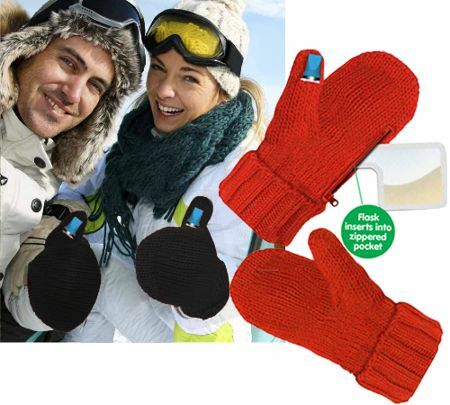 Hence, why not kill two birds with one stone thanks to the $19.99 Mitten Flask? The name itself gives the game away, as you can literally keep your favorite liquor close at hand, thanks to the inclusion of a 3 oz. flask in one of these mittens.